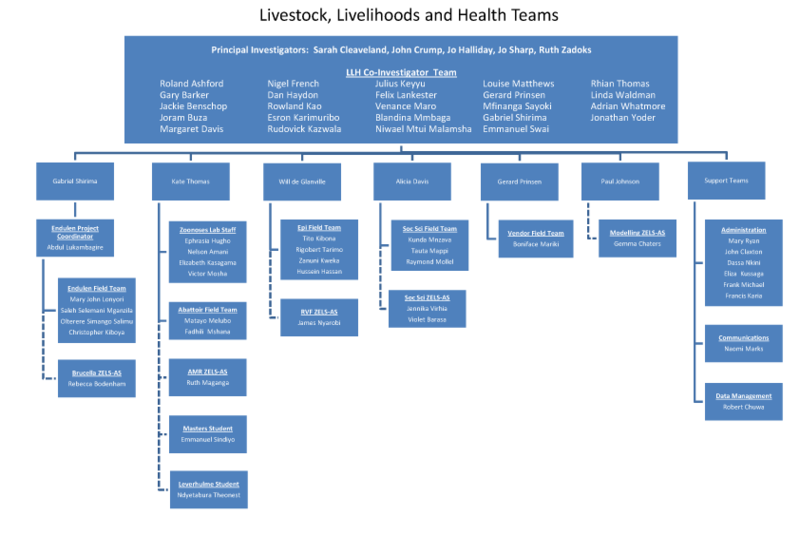 The Livestock, Livelihoods and Health programme comprises a strong interdisciplinary team from institutes in the UK, Tanzania, New Zealand and USA. 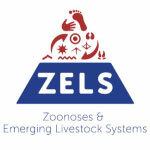 It includes global experts in veterinary epidemiology, public health and social sciences. Download a pdf of the LLH organogram. Joram Buza is Associate Professor in the School of Life Sciences and Engineering in the Nelson Mandela African Institution of Science and Technology (NM-AIST). His main specialisms are immunology and proteomics. Sarah Cleaveland is a veterinary epidemiologist with more than 20 years’ experience in Tanzanian research at the interface of human, livestock and wildlife health. She is Professor of Comparative Epidemiology at the University of Glasgow and Visiting Professor at the Nelson Mandela African Institution for Science and Technology. John Crump is an expert on infectious disease epidemiology in low-resource areas. The director of the KCMC clinical research programme for more than 10 years, he is now the inaugural McKinlay Chair of Global Health at the University of Otago. His work has contributed considerably to the improved management of severe human febrile illness in Tanzania and provides insights into disease control strategies. Jo Halliday is an infectious disease epidemiologist with expertise in the surveillance of zoonotic pathogens in linked animal and human populations. She is a research associate at the University of Glasgow. Rudovick Kazwala is a leading Tanzanian veterinary scientist and a professor at Sokoine University of Agriculture. His work on zoonoses, livestock diseases and emerging disease threats has been influential in policy development at national and regional levels. Sayoki Mfinanga is a leading Tanzanian veterinary scientist and a professor at Sokoine University of Agriculture. His work on zoonoses, livestock diseases and emerging disease threats has been influential in policy development at national and regional levels. Jo Sharp is Professor of Geography at the University of Glasgow. She has worked in a number of international research projects, leading on questions about local people’s knowledges and the power relations within communities. Emmanuel Swai is a veterinarian at the Ministry of Livestock and Fisheries Development in Tanzania. He is active in primary research, focusing on brucellosis and other pathogens of economic importance as well as in development initiatives aimed at improving livestock production and human livelihoods. Ruth Zadoks is Professor of Epidemiology at the University of Glasgow. She has more than 15 years’ experience in molecular epidemiology as applied in the dairy, beef cattle and sheep industries. And she has a particular interest the use of DNA-based methods to refine the characterisation of micro- and macroparasites. 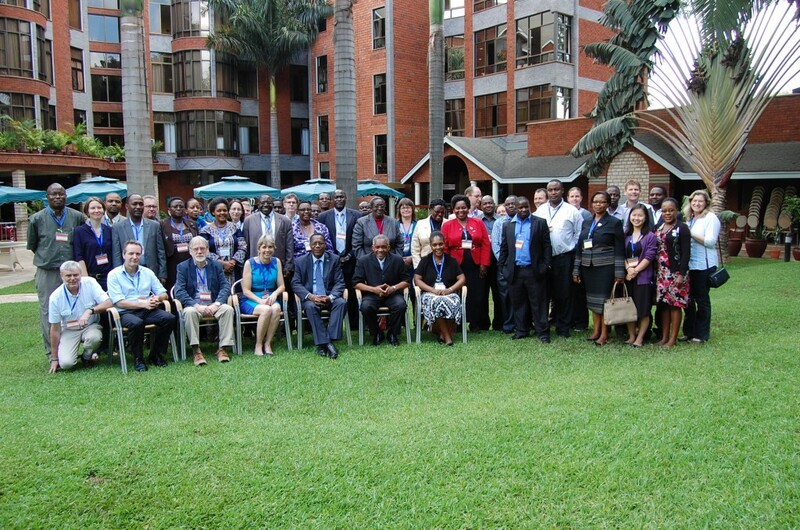 Team photo from LLH inception workshop, Arusha, December 2014.